In each of the past two years, Rep. Paul Ryan (R-WI) has treated the American people to an unabashed, right-wing take on the federal budget in the form of the House Republican budget blueprint. He built the two prior budgets around the central idea that nearly everyone had to make substantial sacrifices for the sake of deficit reduction: Our seniors would have to give up traditional Medicare, our children would have to make due with substandard education, and our middle-class families would have to get by with fewer services while paying higher taxes. While seniors, children, and middle-class families were asked to sacrifice, however, the very rich were rewarded with enormous tax cuts. With Rep. Ryan’s nomination as the Republican vice-presidential candidate in the 2012 election, the American people were allowed to decide for themselves whether they agreed with the priorities laid out in his budgets. Clearly, they did not agree. 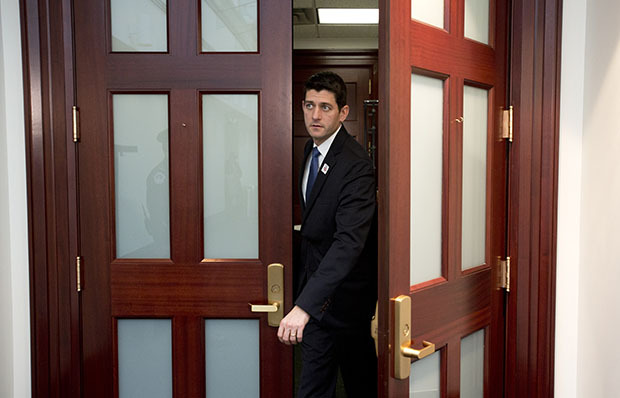 A majority of voters rejected Rep. Ryan and his approach to the federal budget. And now, with the release of his third budget plan, we have the opportunity to find out if Rep. Ryan and his colleagues learned anything from that experience. Unfortunately, the answer appears to be “no.” For the third year in a row, Rep. Ryan has offered a budget plan that asks much of middle-class and low-income families but nothing at all from those at the top. All of the main elements from the last two House Republican budgets remain—turning traditional Medicare into a voucher system, handing out tax breaks for the rich, slashing investments that drive our economy, and favoring European-style austerity over growth. The American people did not buy the plan before, and they won’t buy it now. One key element of both of the past two House Republican budgets offered by Rep. Ryan is an end to traditional Medicare. This budget is no different. Once again, the budget ends Medicare’s promise of guaranteed benefits and replaces it with vouchers to purchase private insurance or Medicare. As insurance companies cherry picked the healthiest seniors to join their plans, traditional Medicare would be left with the sickest, most expensive patients, leading to a downward death spiral for traditional Medicare. At the same time, the value of the vouchers would not keep up with the rising cost of health care, allowing insurance companies to reap big profits as seniors would be forced to pay more for the same benefits they have now. This issue was extensively litigated during the 2012 election, and the American people rejected Rep. Ryan’s and the Republicans’ approach. There was probably no single topic discussed as comprehensively during the 2012 presidential campaign as the issue of taxes. Rep. Ryan and his running mate, former Massachusetts Gov. Mitt Romney, promised dramatically lower marginal tax rates paid for by the reform of tax expenditures. But Gov. Romney and Rep. Ryan famously refused to detail exactly how that plan would actually add up. The current House Republican budget runs the same play again. They’ve promised lower rates, no revenue loss, and no way to make the numbers work. And just like the Romney tax plan, there are only two possible outcomes with the Ryan plan: a tax hike on the middle class or a massive increase in the debt. Either way, the plan offers enormous tax breaks for the rich—and either way, the American people were very clear that this was not the direction in which they wanted to go. At a time when our economy is recovering and when the unemployment rate is at its lowest level in four years, the House Republican budget threatens to turn the clock back on our economic recovery. The House Republican budget would cut hundreds of billions from middle-class investments in areas such as education, science, and infrastructure. These are investments that create jobs and boost economic growth in the short term while strengthening our long-term economic competitiveness. By dramatically cutting these critical investments, the House Republican budget would undo the gains made during the past few years and rob Americans of future economic opportunities. The 2012 presidential election isn’t the only important event that should have had some impact on Rep. Ryan’s thinking in the months between his previous budget plan and now. Over the past year, austerity has pushed the euro zone back into recession, and the United Kingdom is verging on a triple-dip recession of its own. One might expect that the failure of European-style austerity economics would prompt Rep. Ryan and his colleagues to re-evaluate their commitment to massive spending cuts and enormous immediate deficit reduction. One would be wrong. The House Republican budget again includes trillions of dollars in spending cuts, including $529 billion over the next two years alone. And just as before, it does not contain one new job-creation proposal. This severe austerity approach did not work for Europe, and it won’t work for us here in America. But similar to many other lessons, this is one that Rep. Ryan has not learned. Just a few months ago, Americans were given a clear opportunity to endorse Rep. Ryan’s approach to the federal budget. His name appeared on all 130 million ballots cast in last year’s presidential election. While many people did vote for him, the majority voted for a presidential ticket that explicitly and clearly rejected most of Rep. Ryan’s priorities. And in an election in which the federal budget was a primary topic of debate, no one can deny that each side had ample opportunity to convince the American people. Despite suffering a stinging loss at the polls, Rep. Ryan has offered a budget that is quite literally more of the same. Medicare is still transformed into something nearly unrecognizable. The middle class and the poor are still being asked to pay for enormous tax cuts for the rich. Education, infrastructure, and scientific investments are all still slashed, and austerity is still the driving economic theory. The American people had their chance to support this approach and thought better of it. The question now is: What will it take for Rep. Ryan and his colleagues in the House to do the same? Michael Linden is the Director for Tax and Budget Policy at the Center for American Progress. Anna Chu is the CAP War Room Policy Director at the Center.